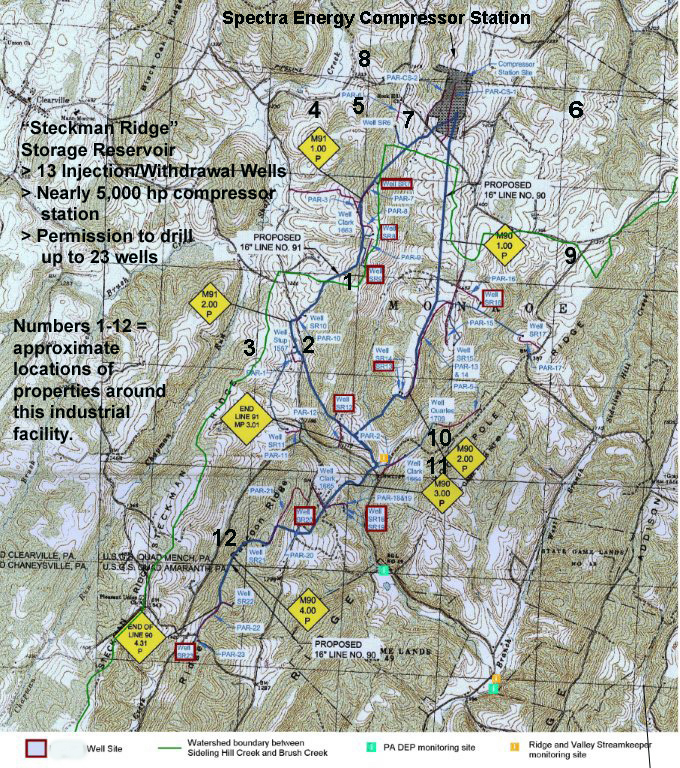 Map shows cluster of properties (#1-12) surrounding Spectra Energy's industrial compressor/underground storage facility with 13 injection/withdrawal wells. If nothing is wrong at Spectra Energy’s huge compressor and underground “storage” facility with 13 injection/withdrawal wells in Clearville, PA – why has the company installed a reverse osmosis water filtration system and a methane vent or separator on two nearby properties? Why is there a ring of health, water and operational complaints surrounding Spectra Energy’s heavy industrial facility that began phased-in operations in 2009? Called the Steckman Ridge storage facility, it was constructed under the threat of eminent domain in order to seize surface and subsurface property rights, an action approved by the Federal Energy Regulatory Commission (FERC). A cluster of families and property owners around the compressor station and its 13 (so far) injection/withdrawal wells, is shown on the attached map. Many of these property owners will not talk about these issues, some on the advice of lawyers (guess what that means). Others may have signed nondisclosure agreements with Spectra Energy. This is a standard gas industry practice to protect the corporate interest by gagging individuals. It results in suppressing information that might be supportive to public health and the safe operation of such facilities. Typically, the gas industry will tack a financial penalty clause on such agreements should the property owner even accidentally disclose. Despite all of that, Clearville, PA, is a small community where neighbors and family members talk. And a nondisclosure agreement only begins on the day it is signed. In addition, FERC has confirmed the broad outline of the methane venting and reverse osmosis water system incidents along with its perspective on why this happened. Sharing this information may help regulators at the state and federal level ensure safe operation at this heavy industrial facility located in Bedford County, PA, near the Maryland border. The attached map indicates 12 properties surrounding the compressor station and the injection/withdrawal wells. All of these residents apparently have experienced some problem – from health complaints, water contamination, livestock and pets dying, and even a well head blowing off due to a build up of pressure from methane. In 2009, the water well cover on James and Karla Levy’s property blew off four times, according to the Levys. Once, it reportedly blew windows out of the barn. The Levy property is shown as number one on the map and it is located near Steckman Ridge well SR10, which was placed into service on April 1, 2009, according to FERC. Spectra Energy installed a methane separator and/or vent on the property, according to the Levys and FERC. Maggie Suter, the FERC project manager for Steckman Ridge, was forthcoming with background details from memory. Suter recalls that Spectra Energy investigated and found methane present in the well. Using gas chromatography, the company is said to have determined that the methane in the well was not the same as the methane in the storage reservoir, according to Suter. Out of concern for the safety of its workers and “to keep good relations with the neighbors,” Suter says, Spectra Energy agreed to install a vent on the well. “Prior to 2009 we NEVER had a problem with our well or our water. The well head blew off 4 different times in 2009. “When Spectra ‘sniffed’ our well and home, methane was detected in the well and in the house. They acted quickly to try to correct the problem while saying ‘we cannot confirm that the source of the problem was anything we did but we want to be good neighbors.’ Why would they want to correct a problem they felt wasn’t their fault? From Spectra Energy, I requested a copy of the gas chromatography test results since this could support its actions and I will share that in Part 2, if a reply is received. David Stup’s property is shown as number two on the map and is near three injection/withdrawal wells, SR10, SR11 and Stup 1557. According to FERC, SR10 and SR11 were placed into service in April of 2009. Stup 1557 went into service the following month. In the middle of 2009, the Stup’s water well pump and filter became clogged with a dark oily goo according to several persons close to the situation and confirmed generally by FERC. The well pump quit working. When they pulled the filter, it was said to be clogged solid with a black, oily substance. The pump burned up. Stup replaced the pump and the filter, but it happened again. Eventually, Spectra Energy installed the reverse osmosis water system. Repeated phone calls to the Stups were not returned. FERC’s Suter recalls generally the issue with Stup’s pump, but does not have a formal report for the incident. She remembers only that a water filtration system was offered at one point. “Although we don’t like to see/hear about these types of issues, we do try to recognize the potential for issues in our Environmental Assessment (EA),” she says. Suter also raised a question about what may or may not have happened with the original five wells drilled by Pennsylvania General Energy (PGE). In 2003, about 150 landowners in the Clearville area signed lease agreements with PGE. The company drilled five wells in the Oriskany formation, then sold the assets to Spectra Energy in 2007, saying the gas wells were depleted. “We [at FERC] cannot tell what may be a result of PGE’s drilling before Steckman ever drilled anything.” She suggested contacting the Pennsylvania Department of Environmental Protection (DEP). I have contacted DEP on this matter and expect to include its reply in Part 2 of this series, as well as the response received from Spectra Energy. NOTE: This article is cross-posted on the Accountability Central website at this link: http://www.accountability-central.com/nc/single-view-default/article/voices-from-the-shale-problems-surround-spectra-energy-compressor-station-why-part-1/ Accountability Central is part of the Governance & Accountability Institute, Inc.